Nominal efficiency, economical. Our 8000 series depth filter is an exceptional value for general applications where long-life, high purity, and low change-out frequency is required. Fox Filtration pure polypropylene cartridge design combines efficiency, long life and purity to create a high performance depth filter. Thermally bonded micro fibers create a strong, secure cartridge that traps particles throughout its depth. Fox Filtration pure polypropylene cartridge design combines efficiency, long life and purity to create a high performance depth filter. Patented, continuous process assures consistent product performance. Lot to lot, order to order, strict quality control assures repeatability. No surface blinding, which reduces flow and increases filter change outs. Wide range of polypropylene end-adapters including gaskets, extended cores and seating options available. F15 Single open end with flat end closed, external 226 O’ring (double O’rings) with locking tab. Note: All cartridge O’rings or Gaskets are supplied as noted. If you require an elastomer not listed please email your specific request for quotation. 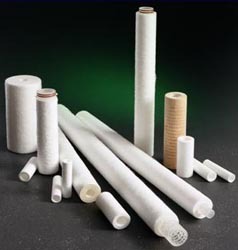 Santoprene (Flat gasket only) Santoprene is licensed to Advanced Elastomer Systems L.P.
Viton Viton is a registered trademark of E.I Dupont de Nemours and Company Inc.
Fox Filtration cartridge filters are made of thermally-welded blown micro-fibers of polypropylene. No additives, resin binders, lubricants, anti-static or release agents are used in the manufacturing of FiltraTek cartridge filters. Fiber material meets the requirements of the Food and Drug Administration (FDA) Title 21 of The Code of Federal Regulations 174.5 and 177.1520.